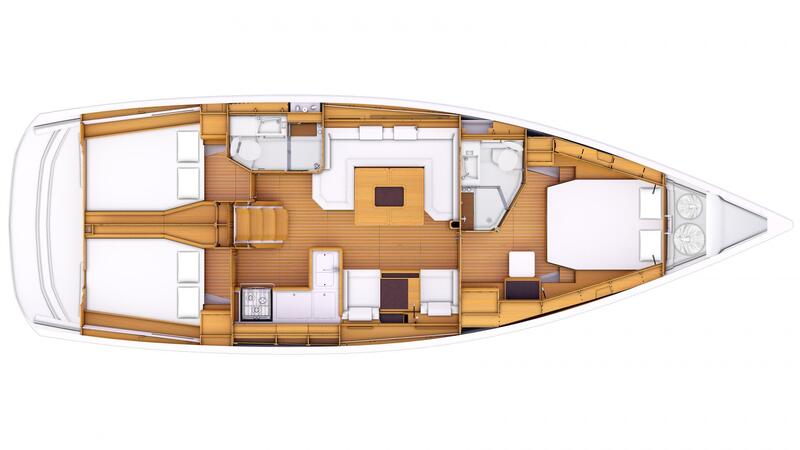 We are new owners of a 2015 SO 469, 3 cabin 2 head layout. 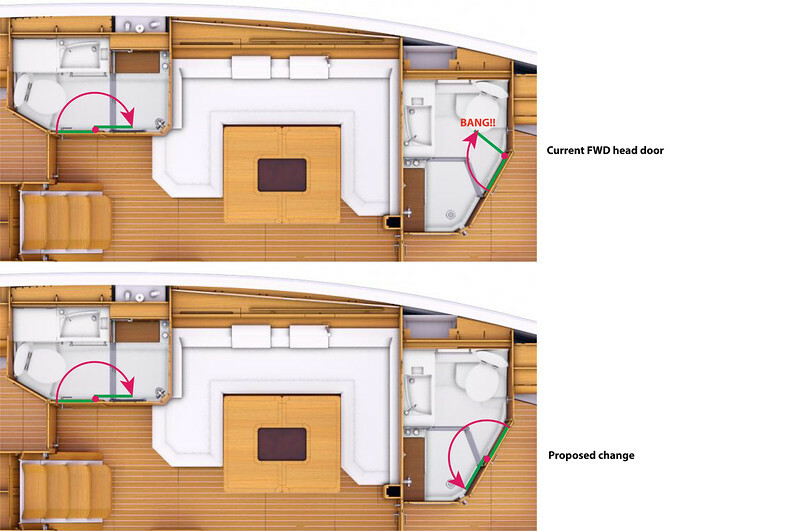 Has anyone considered switching the fwd head door so that the hinges are on the left, mirroring how the aft cabin door swings. Currently it swings into the toilet, with no way to secure it in an open position. This requires first stepping into the shower and closing the door in order to stand in front of the sink or use the toilet. In the aft head the door swings into the shower area, where it can be neatly secured over the folded shower screen. I can't see any reason the fwd head door couldn't work the same way, but thought I'd float the question here just in case there is a "gotcha" I'm missing. I added a magnetic door catch to keep mine still. When underway I use a shock cord to the towel rack from the door handle. I haven’t looked at changing the hinge side. But now I will look at that option. Here's a markup of the interior design showing what I mean (thanks MalcomP). Which brings me to another question. In the FWD head the shower "curtain" folds so that the loose panel (bitter end?) folds in under the attached (to the shower wall) panel, so that one latch holds them both snugly in place. However, in the AFT head, for some reason the panels are fan-folded, so that the attached panel is first folded flat against the wall, then the loose end folded over that. The result is that now both sides of the loose panel must be latched to prevent it from pulling away, banging and possibly getting damaged in a seaway. Any reason it isn't done the same as the superior FWD head panels? Mine was that way. I assumed it was an assembly error and I turned the intermediate hinges that hold the out panel around so that now it is the same as the forward head shower door and the one latch holds them both securely. I thought the same thing...assembly error. But funny it should happen more than once. You’ve led the way with the correction! Were there any unexpected difficulties? It looks like the machine screws are threaded all the way through, so the job should require little more than a screwdriver, no? Just a screwdriver. But a helper makes it easier. Hi Moonshadow, thanks for the reply. 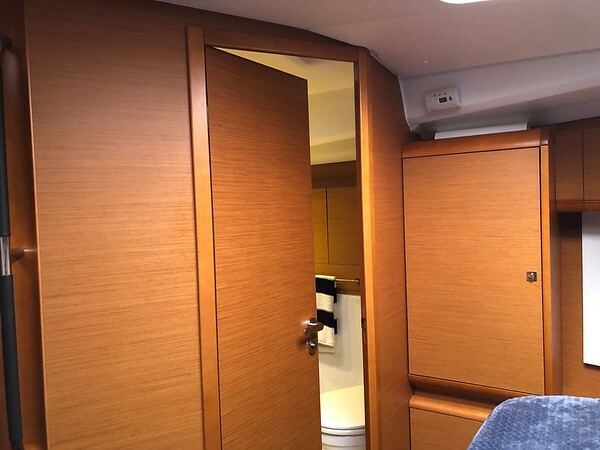 I was aboard yesterday and looked at that aft shower screen, and it looks like the space between the "attached" panel and the shower wall at the hinge isn't quite enough to accommodate the "loose" panel, with its two magnets. So now I'm thinking I might find two more magnets and mount them on the "attached" panel opposite those on the "loose" panel to hold the two together. So now I need magnets, fasteners, drill and tap. This is definitely not simpler, but in my case I'd have to move the attached panel's hinges another 1/8" away from the wall to make it work. Mine fit fine. The panels are sized to fit. Try it first before deciding. Finally reversed the forward head door of our SO 469...now we don't need to step around into the shower to wash our hands! I added a magnetic door stopper to hold the door all the way open, just like the aft head. Much nicer. Have you just left the old holes or filled them with some wood filler? I think i'll go for reversing the aft shower doors as mine bang in a seaway, but kind of got used to the bungee cord holding the fwd head door open. Thanks for the follow up report. This sounds like a project for my list of yo do”. The cosmetics are next. Yes, we plan to fill the old hinge screw holes and the strike plate opening with wood putty. But what a difference the change makes! It looks like the aft head door is the way it is so that when it’s closed for someone in the shower that the hinges prevent the middle from pushing aft and therefore folding the door should it get bumped when someone is in the shower. How’s it been for someone using it with the hinges flipped? I have to use a small wooden wedge to hold the door in place. Anyone else have the same issue? I think I’ll add a magnet on the inboard door to hold the flappy side when it’s folded. That's an interesting thought about the aft shower door hinges. I just reversed mine last weekend (after I'd finished reversing the forward head entry door), but haven't yet taken a shower, not even in our berth let alone in a seaway. I'll be on the boat this weekend, so I'll test it and let you know. If it is a problem, maybe a latch like the one on the companionway doors would be a solution. Instead of your wooden wedge we were using a giant clothespin at the top to hold the two shower screen halves together when closed, which also seemed to work pretty well. The magnet you mention would be a neater solution. I reversed the shower door and I have not had any problem with it. The magnets keep it in position when using the shower. No clips etc needed in my boat now. Following a simulated shower :-) the other day, my experience agrees with Moonshadow's: the shower curtains are held in place adequately by the magnets. In my case I had to remove one of the magnets to provide enough clearance for the outer curtain to fold inside the inner one, but one magnet is enough. The alternative for me was to move by 1/8" the 3 hinges that the inner curtain swings on to provide more clearance, but removing the upper magnet (which is closest to the center hinges) was enough to allow the curtains to fold without too much stress. Just double taped a magnet to the door. Works a treat. It just uses one of the original metal strips. Why it wasn’t there in the first place I’m not sure. Nice! What brand/type double-sticky tape did you use? It's impressive that it is able to hold--those magnets are pretty strong. It’s just some cheap ones off amazon. Think it was 3M tape on the back though. Will get round to tapping and screwing it in.